Alaska has long crawled with visitors in the summer months. Now, more people are hopping aboard the Alaska Railroad for winter tourism here, too. The number of passengers taking the train between Anchorage and Fairbanks during cold, snowy months has shot up over the last few years. The railroad has added more train service to accommodate them. Some tour companies have even beefed up their winter offerings to court such visitors. One driver is tourists visiting from Asia, often on hopeful trips to see the aurora borealis, said Dale Wade, vice president of marketing at the railroad. “Winter is suddenly very popular, and it’s growing steadily for the last three years,” said Wade. Before that, there wasn’t a “significant market for it," he said. Ridership on the Alaska Railroad’s winter passenger trains grew 33 percent between the winter of 2015-16 and the following winter, said spokeswoman Meghan Clemens. That’s “the largest single jump year-over-year," she said in an email. For years, winter passenger train service between Anchorage and Fairbanks typically only ran on the weekends from late September through early May. In 2014, the railroad added midweek trains between the two cities and there have been more departures added since, said Clemens. In the winter of 2012-13, there were 66 days of winter passenger train service. Compare that to 102 days this season. It’s not just rail passengers; Over much of the last decade, Alaska visitor numbers in the fall and winter have been on the rise overall. Visitor volume in the fall and winter grew 33 percent between the 2008-09 season to last year’s, according to the McDowell Group, an Anchorage research firm. The Chinese market has “exploded” over the last several fall and winter seasons, according to a McDowell Group report. One Anchorage company, Alaska Skylar Travel, focuses on bringing Chinese tourists to Alaska. The business has its roots in Beijing, and it targets the Mandarin-speaking market. In its first winter, the business had about 350 clients, said operations manager Glen Hemingson. That number has since swelled, reaching about 5,000 clients last season in its fourth winter, and the staff has grown. Hemingson largely credits the company’s marketing efforts, much of which takes place in China. “Increasingly we see visitors from more Southeast Asian countries, including the Philippines, Vietnam, Malaysia, Singapore,” Hemingson said. While U.S.-China trade relations have been strained recently in a tariff war, that doesn’t seem to have harmed Asian tourism here, said Wade. “I think Alaska is a favored location for Asian visitors, despite the conflicts that seem to be arising politically between U.S. and China relations,” he said. “We’re enjoying the sweet spot in between that." Alaska has been working to strengthen its ties with China, too. Earlier this year, former Gov. Bill Walker’s office announced new year-round direct passenger flights between Anchorage and the northeast China city Harbin, set to start in 2019. And it’s not just tourists from Asian countries who are taking the railroad to see the northern lights and snowy mountains. The top markets for winter visitors riding the trains are the U.S., Australia, China, Taiwan and Canada, said Clemens, with the railroad. There’s been so much added interest in taking the train during the winter that it’s been “a little frustrating” for reservation agents, she said. One simple explanation for booming winters? “It’s beautiful,” said Adriel Butler, co-owner at Borealis Basecamp, located outside Fairbanks. There, people can stay in geodesic domes with big windows for aurora-gazing from the comfort of a bed. Sarah Leonard, president of the Alaska Travel Industry Association, said she’s noticed more winter offerings from tourism companies here. “We’re seeing an increase in popularity in people wanting to see the aurora,” she said. At Alaska Skylar Travel, things started based on tourists' desire to come see the northern lights, Hemingson said. But since then, it has grown to offer more. That includes city tours, snowmachining and dog sledding. “We’re offering more tour opportunities during the winter for activities, particularly in Fairbanks,” he said. Last winter, in its first year of operations, about 60 percent of Borealis Basecamp’s guests were from Asia, said Butler. This year, less than half. There’s been an uptick in visitors from the Lower 48, Canada, and Latin America, he said. 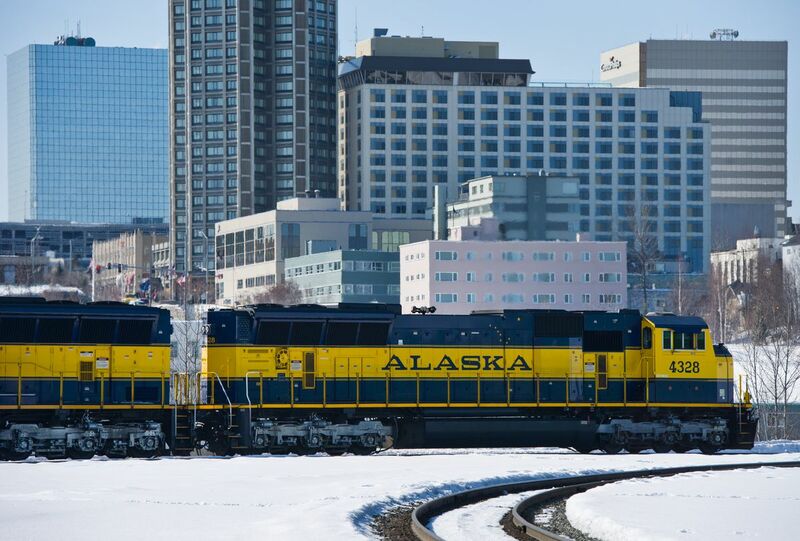 Growing passenger service has also been a financial bright spot at the Alaska Railroad, which a couple of years ago was struggling with a declining revenues and had layoffs last year.